Hemas Holdings PLC delivered some strong top and bottom line performance during the quarter ended in December 2018 (3Q19) led by its key consumer business along with the recent acquisition in the sector. Hemas Holdings, a diversified conglomerate with interests in FMCG, healthcare and pharmaceuticals, leisure and logistics recorded revenues of Rs.18 billion for the quarter under review, up 47 percent year-on-year (YoY). Despite the negative impacts from the currency depreciation and weak consumer sentiments, the operating profit soared 93 percent YoY to Rs.1.9 billion as margins improved in the domestic personal care segment. “Overall, the macro environment was challenging during the quarter with significant currency depreciation impacting profitability and political uncertainty eroding consumer and business confidence. Hamas Holdings Limited achieved higher revenues and profit growth primarily due to the solid performance at Atlas, during its critical Q3 season”, Hemas Group CEO Steven Enderby said in an earnings release. He further said that the group anticipates a challenging last quarter for the business as the full impact of devaluation hits cost structures. “However we continue to work hard to sustain our strong growth in the final quarter of the financial year,” he added. 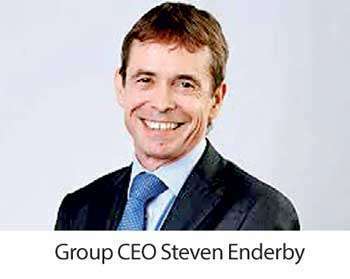 As part of its multi-year strategic re-orientation exercise and re-organization of its different businesses under Enderby, the group exited certain non-related businesses and added more muscle to its core business segments. In 2016, Hemas Maritime (Pvt) Limited won the general agency status for Evergreen Lines, one of the largest international shipping companies. In 2018, Hemas bought 75.1 percent stake in Atlas Axillia, a leading stationary sector player in the country for Rs.5.7 billion. Last November, Hemas Holdings divested Hemas Southern Hospitals (Pvt) Limited to Asiri Hospital Holdings PLC for Rs.450 million to focus on its two remaining hospitals in Thalawathugoda and Wattala which have a combined bed capacity of 184 and a network of 34 diagnostic laboratories. The earnings for the three months was up 50.4 percent YoY to Rs.1.03 billion or Rs.1.78 a share compared to Rs.681.9 million or Rs.1.19 a share in the earlier period. Earnings for the nine months ended December 31, 2018 was up 19.2 percent YoY to Rs.2.51 billion or Rs.4.36 a share. Sales for the nine months stood at Rs.48.03 billion, up 38 percent YoY. The group’s consumer business for the 3Q19 generated total revenues of Rs.8.1 billion, up from Rs.4.0 billion YoY. The company said over 85 percent of the revenue growth during the nine months was driven by Atlas. “Atlas has recorded a solid performance during Q3 with year-to-date revenues up by 13 percent over the same period last year. Atlas market share increased in its core categories and has also seen growth in its new back to school segment comprising of school bags,” Enderby stated. The segment’s earnings rose by 140 percent YoY to Rs.841.7 million for the quarter. Healthcare segment, which is led by the pharmaceutical business, recorded revenues of Rs.7.1 billion against Rs.6.04 billion YoY. However, the earnings narrowed to Rs.338.8 million from Rs.402.9 million due to compressed margins that stemmed from the price regulation and significant currency depreciation. The group’s leisure, travel and aviation segment returned to profits during the quarter recording Rs.4.4 million profit on revenue of Rs.1.25 billion, up from Rs.1.01 billion in the year earlier period. The group’s logistics and marine sector reported earnings of Rs.109 million compared to Rs.126.1 million in the year earlier period on revenue of Rs.782.6 million, up from Rs.759.4 million. The Esufally family has a 61 percent stake in Hemas through various investment vehicles, while Norges Bank, Norway’s giant wealth fund operating under its Central Bank, has 2.99 percent stake in the company. Franklin Templeton Fund also has 6.92 percent stake in Hemas.